One DeKalb County School District (DCSD) senior’s hard work, persistence and vision for the future has paid off in the largest way imaginable: a full-ride scholarship to one of the nation’s most prestigious universities. 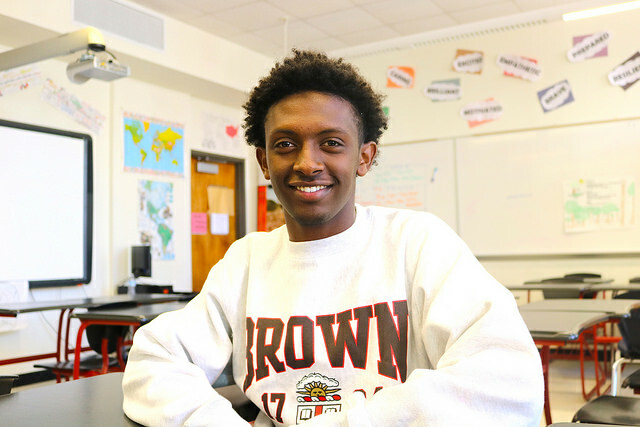 Druid Hills High School senior Ermias Genet is a recipient of the Questbridge Scholarship, a much-sought-after program that connects low-income, high-achieving students with elite institutions of higher education. The organization allows for students such as Genet—an Ethiopian political refugee since the age of 10—the chance to consider the nation’s best colleges and universities as options. QuestBridge gives Genet the option of attending such schools as Brown, Dartmouth, Vanderbilt, Amherst, Emory and Rice. While he could become a Commodore, an Owl, Mammoth or Keggy, he plans on becoming a Bear at Brown by Fall 2018. Genet already has his first piece of spirit wear: a heather grey, pull-over crewneck sweater. It bears the Brown crest as well as the school’s founding year, 1794. He’s sure he’ll need it on campus, which is located in Providence, Rhode Island. Brown’s open curriculum does not require students to take “core” classes or distribute course hours into specific disciplines, such as a foreign language. Genet says this will allow him to dedicate 100 percent of his focus on biomedical engineering. Obtaining entrance into Brown—a top 10 university worldwide—is surreal for Genet because of his past. He remembers how much of a culture shock it was upon his arrival. He can still recall how his parents had to sacrifice their careers for survival. 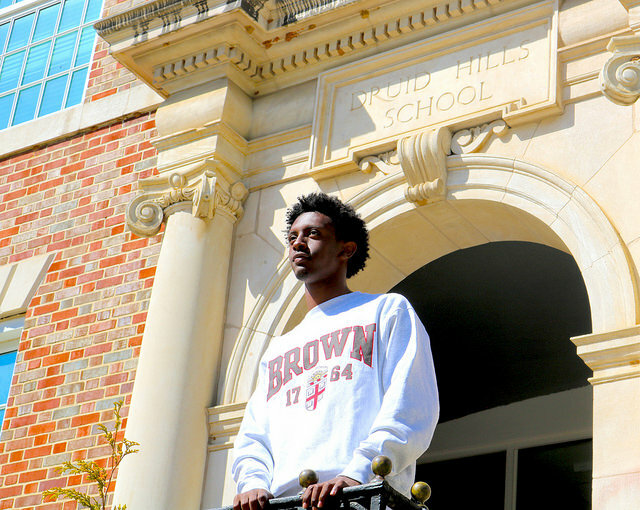 He views attending Brown as a suitable catharsis and a chance to repay his parents’ sacrifice. During his time at Druid Hills High, Genet has become captain of the cross country team, a player on the soccer team, president of the Spanish National Honor Society, a member of the National Honor Society, Science National Honor Society, BETA Club, International Club and Future Business Leaders of America—all while earning a 4.3 weighted grade point average. Genet said one long-term goal, when his Brown days are over and his career is nearing its apex, would be returning to Ethiopia to better the country’s medical conditions. “I’d definitely love to go back home and maybe build a hospital,” Genet said. Genet’s advice in gaining entry into the country’s most prestigious universities? Never undervalue your own opinion of yourself. He also advises to speak your individual truth and share your story, as admission boards typically value genuineness.